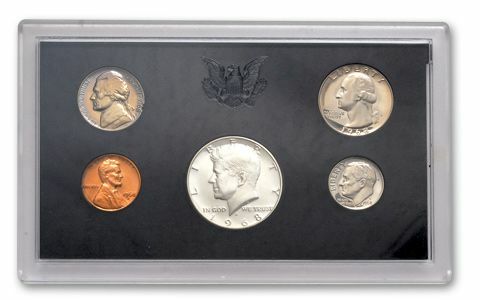 Add the first five S-Mint Proof Sets to your collection - for less than $16 each! Just a year after California's Bay Area became famous for hippies and Haight-Ashbury during the legendary 1967 "Summer of Love", the San Francisco Mint struck its first-ever U.S. Proof Set. Packaged in blue, the 1968 U.S. 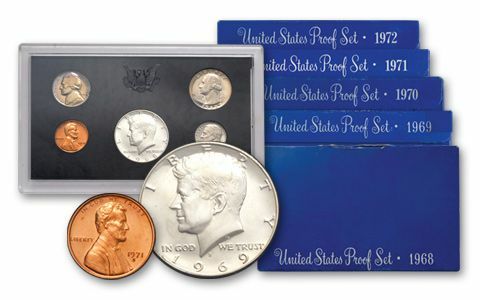 Proof Set would be just the first of five official sets issued by the mint through 1972! 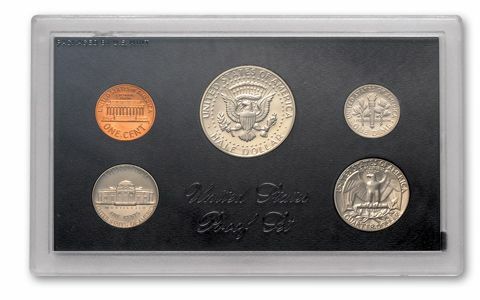 1968: the first year that Proof Sets were struck at the San Francisco Mint and the first Proof Sets with a mintmark! 1969: the year Apollo 11 landed on the moon - and the last year that any circulating U.S. coins contained precious metal! Each set includes one Proof-quality example of each coin released in each year, including the Lincoln Cent, Jefferson Nickel, Roosevelt Dime, Washington Quarter and Kennedy Half-Dollar. But unlike coins produced for general circulation, these Proofs were struck three to four times with specially-prepared dies on polished planchets, giving each razor-sharp images and mirrored backgrounds. And best of all, each set comes just as it was released from the San Francisco Mint in its original blue packaging! Reserve this complete five-year collection for less than $16 a set! Try to find all five of these sets separately and you could pay as much as $93. But why bother when we've done all the legwork - and you can get all five of the first S-Mint Proof Sets for a fraction of what you'd pay for the last five years of Proof Sets! Order these first five Blue Box Sets today and you'll save nearly 14% - plus you'll get a bonus storage box absolutely FREE! Wait another 40 years and they won't be so easy to find! Order yours now!